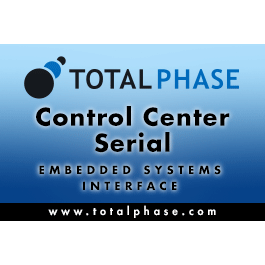 The Control Center™ Serial Software provides easy access to all the features of the Promira™ Serial Platform (with I2C or SPI applications installed) and the Aardvark I2C/SPI Host Adapter. Within minutes, developers can make full use of I2C, SPI, and GPIO functionality. Multiple Promira platforms or Aardvark adapters can easily be used at the same time. A virtually unlimited number of configurations is possible to help engineers develop and test their embedded systems. 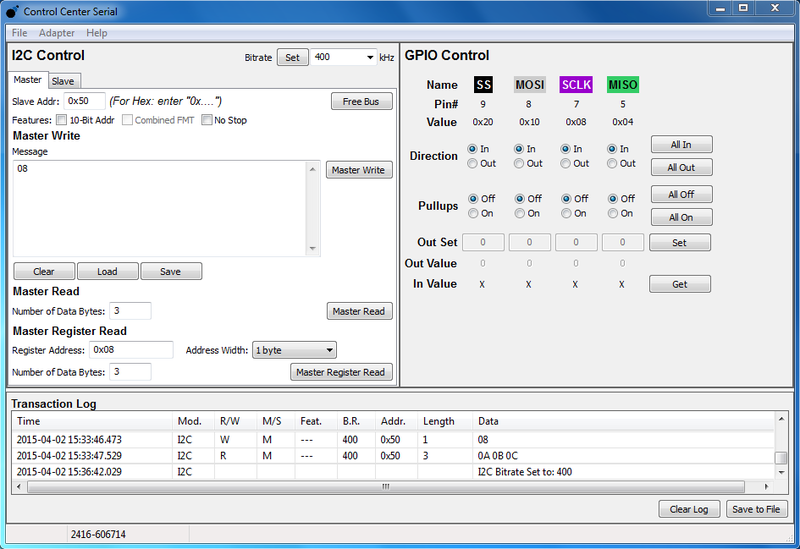 Detailed technical information about the Control Center Serial Software can be found in the User Manual. Please click on the appropriate software version for your operating system. Login is required for software downloads. If you don't have an account, you will be prompted to create an account before your download commences. Complete access to all the Promira platform or Aardvark adapter features with just a click of a button. I2C and SPI messages can be saved and loaded from binary files, making it unnecessary to reenter them at every new session. 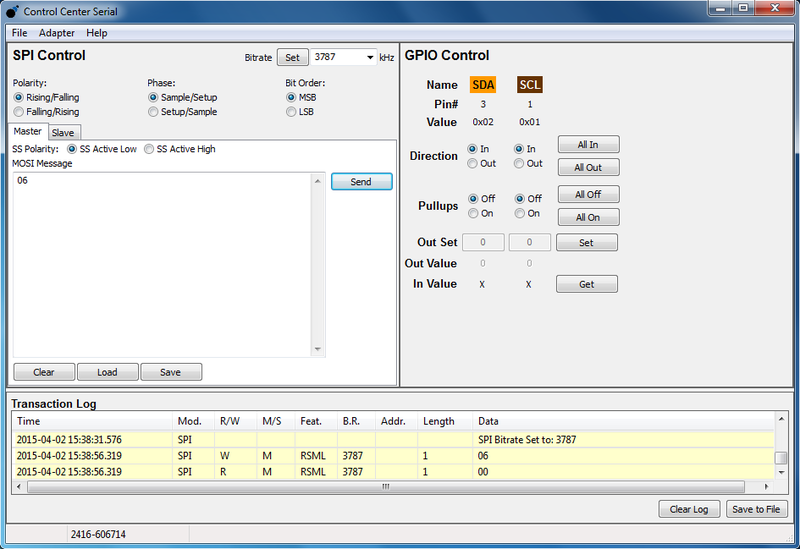 The Control Center Serial Software is freely available on our website to all users. The Control Center Serial software now supports the creation of simple XML-based batch scripts. Create, run, and save custom batch scripts to automate tasks. I2C, SPI, and GPIO functions are available in the scripting language for maximum flexibility. A built-in help system is available to explain all of the commands in the GUI. Examples of the XML batch scripts are included in the Examples package and are available in the Downloads section of the website. All transactions performed by the Promira Serial Platform or Aardvark I2C/SPI Host Adapter are saved in the transaction log. The log stores information about the type of transaction, features used, and the message sent. The data in the transaction log can be saved to a CSV file to analyze the data. Thanks to USB, multiple Promira platforms or Aardvark I2C/SPI Host Adapters can easily be added and used simultaneously on a single computer. 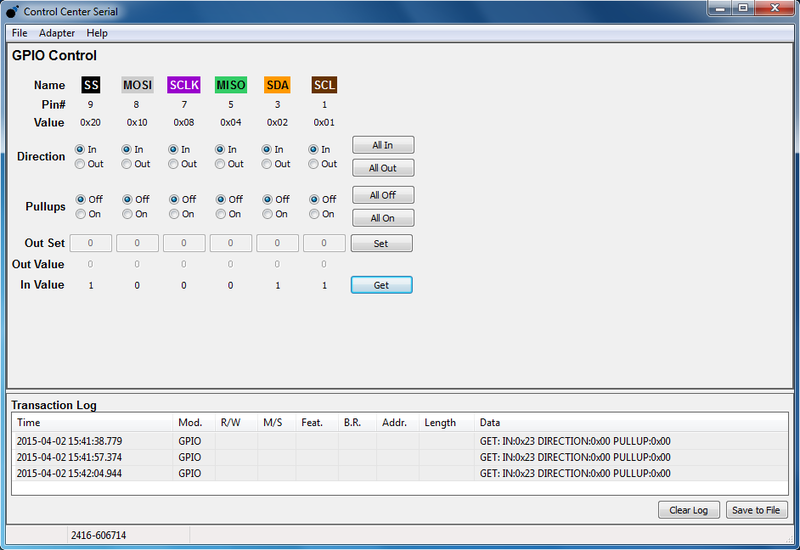 Each window of the Control Center Serial software is bound to a separate Aardvark adapter. An XML-based batch scripting language is used to automate tasks. 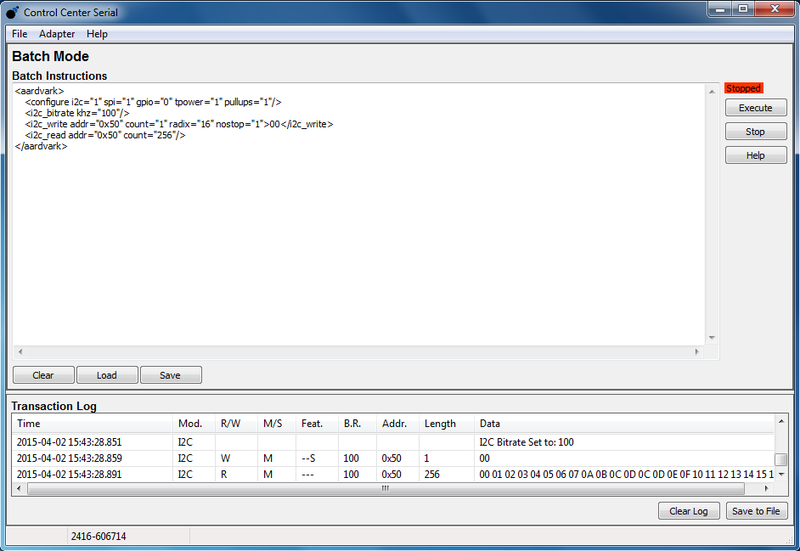 Logs all transactions that come in and out of the Promira platform or Aardvark I2C/SPI Host Adapter. Intel or AMD processor operating at 2 GHz or higher. The software has been designed for Red Hat, Ubuntu, Fedora, and SuSE. Please be aware that there may be significant differences and idiosyncrasies in the way that different distributions of Linux operate. As such, Total Phase may not be able to support your particular distribution of Linux. Support will be offered on a case-by-case basis. The software is supported on Intel versions of Mac OS X 10.7-10.13. The graphical software is offered as a 32-bit or 64-bit application on Windows, Linux, and Mac OS X. Separate 32-bit and 64-bit versions of the API libraries are provided for all platforms to allow custom applications to be built for either architecture. To Run a High Stress Test, How Can I Best Generate Traffic on Multiple I2C and SPI Buses? How Can I Best Control the Bitrate of an SPI Master When I’m Working with Slower SPI Devices? Did You Know Both the Aardvark I2C/SPI Host Adapter and the Promira Serial Platform Support IoT Development with API Scripts? How Can the Software Tools that I Use with the Aardvark I2C/SPI Host Adapter Provide Greater Control for Programming I2C Memory Devices? 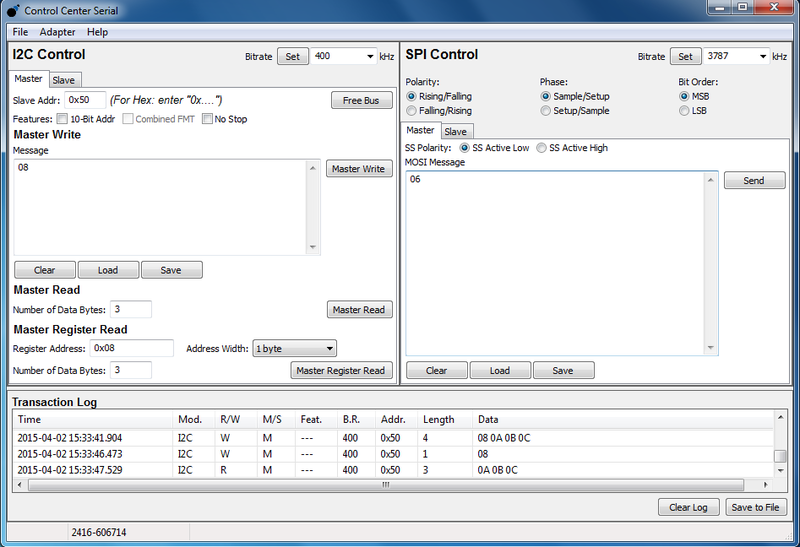 How Many SPI Slave Devices Can I Control with one Promira Serial Platform, and How Can I Use the LabVIEW and Matlab Software Applications? How Do I Configure an Aardvark I2C/SPI Host Adapter or a Promira Serial Platform for CRC and an SPI Slave Device with Flag Signals?